SimsFilmFest season starts January 1 and we know that everyone is starting to look for information about the new season. As most everyone knows, Minraed has stepped down from the Sims International Filim Festival turning it over to Gus Rockman, Peacemaker, and myself. We have been hard at work creating a new interactive website for the machinima festival. We hope that everyone enjoys the new website and finds it easy to use. and join the only Sims Community machinima festival! Voice Actors: Please submit yourself to the voice actors data base. Classified section for your casting calls. I hope that everyone is having fun with their various versions of The Sims games as much as ever. As many of you know or have noticed I have been taking a bit of a break. I needed this for so many reasons, but a lot of that has to do with personal commitments to home, family, work and studies. While I have been essentially completely absent and have dropped the ball on a few things that were already underway, I have not forgotten this community and I do have the intention of coming back with a breath of fresh creativity. I am not sure what the refreshed and updated Simatography community will look like, but what I do know for sure is that we will continue to focus on your creativity; celebrating and sharing and supporting one another along the way. I am around, even though you don't see me much. Typically you can find me on facebook via messenger if you want to be in touch. See you all soon. I hope to spend much of the Christmas holiday season playing here. As you probably have already noticed, there is much talk about my leaving SIFF so here are my goodbye words. What is important is to know that this is meant to be a good thing; to give SIFF enough space to grow and to let Simatography shine again. Our goal is to refresh the website and bring back the focus on other things so stay tuned. We Have a TS4 Pose Player! I had no idea where to put that in the forum so it's going here because this is huge and it's going to make life so much easier for TS4 machinima! 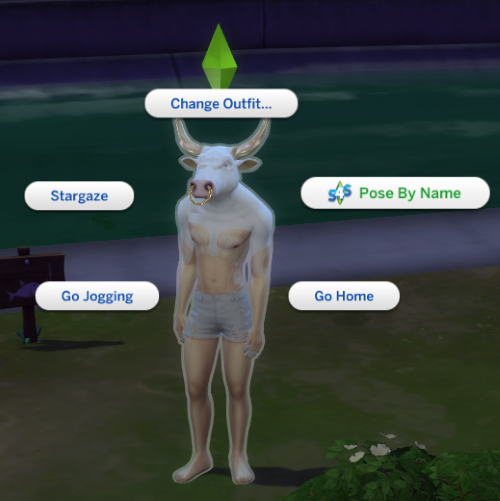 We have a TS4 Pose Player and it plays animations as well! You can find it over at Sims4Studio HERE. You do need to register to use the site. One thing I can say about the survey that we posted is that it's giving us something to write about in the blog area for a change This post in addressing the feedback we have gotten on the survey is going to be quite long, I am afraid. Apologies in advance. "Make a contest only for people who are new with the sims stuff." - In theory, this isn't a bad idea, but it's something that would take time and planning. Having said that, we do have an award for Best New Director. New Director means someone who has made 5 or fewer machinimas. I don't remember how we came up with that number, honestly. t's voted on internally by our Machinima Masters. This season we have a number of people who have been brave enough to share their very first machinima projects with us and we want to do something to bring a bit of attention to these new directors. Since we do acknoweldge the new directors on their own, I'm not sure that we need to set up a contest specifically for them. In some ways I feel that this would be doing them a disservice since SIFF has always been a way to introduce people to new directors and people use it as a vessle to get more views on their projects as well as more subscribers. Doing a separate, new and therefore less known, competition probably wouldn't provide them with that. This is a topic that we really need more feedback on. "I would love to see more of an inclusion for animators, pose makers and cc creators. I know they are already welcomed and encouraged to participate but perhaps if there were awards for say, best costume designer, animation and pose creator more people who aren't as into the machinima aspect would participate and get in on the fun, as well as helping to spread the word." - I feel like I am picking on whoever suggested this but that isn't my intention. SIFF is and always has been about machinima. Without CC makers machinima wouldn't be what it is. It would all start too look the same very quickly. The CC community is a valuable resource. However, this isn't a CC awards show. It never will be. As a CC creator myself, I would love to get more attention for what I do but that's not going to happen, not through SIFF. There is no way we could do this. Every piece of CC, every pose, every animation would need to be kept track of along with what submission it's in there would have to be a way for the audiance to know where and what they are looking at. I don't even want to think about the logistics involved there. Having to pay attention to every little detail, like what outfit Alex, Tyler, and Samantha wore in each scene of "I Dream of Plumbobs" is just going to make the audiance tune out. Yea, CC awards are not going to happen. We do have awards for costume and set design that go to our directors because they are the ones that are putting all the CC together like a giant puzzle and making it work together. Many of our directors list in their credits the CC creators that who's stuff they use. If you want to get the word out for stuff, let us know. We have been telling everyone over and over that we want adverts for the magazines for your content and websites and yet people don't take advantage of this. "I feel like battle of the bands could be more a summer thing." - Battle of the Bands. Ah yes...my baby. LOL! This survey has told us two things that have been extremely helpful. 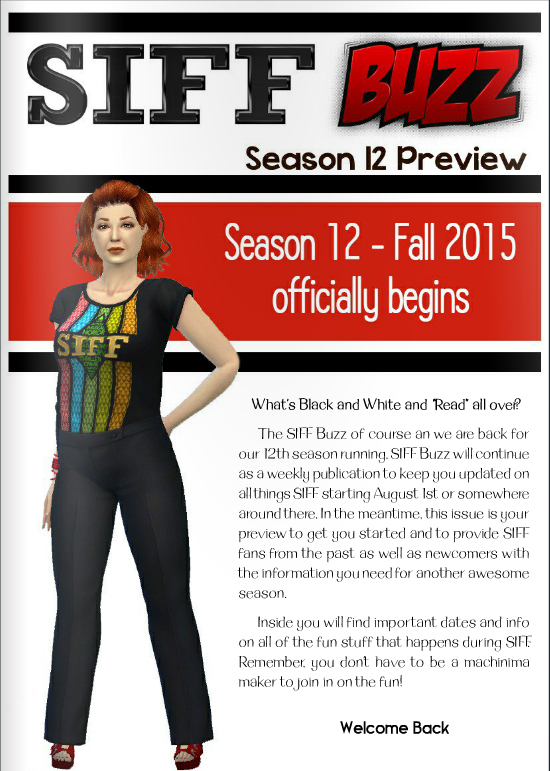 People want two seasons of SIFF because of real life. Some people can't particapate in the spring, but can the fall and vice versa. We're not going to take that away. SIFF and Battle of the Bands have two very distinct audiances and Battle of the Bands should really be it's own thing. We are going to work on making Battle of the Bands it's own thing that runs between SIFF seasons. It's going to take a bit to best decide how to do this, but we think it will be beneficial to both SIFF and Battle of the Bands. "Make the Buzz more prominent/mandatory or just stop spending so much time and effort on it." - I am honestly confused by this. I'm not sure what is meant by "mandatory" here but as far as making it more prominent I am not sure what we can do there. This is one of those things that I wish I could ask whoever gave us this feedback what they meant. We promte it on all our social networking sites as well as post it on the site. It's a fun thing that is put together to help showcase what is going on in SIFF and our survey results show that people do not read it consistantly. We can't tie people down and make them read it and I am not sure what needs to be done to make people show more interest in it. Again, this is one of those things that we need more specific feedback on from everyone in order to make te best decision - that middle ground between what we want to provide for everyone and what everyone finds important/enjoyable. "I feel a bit overpowered by the masters in BOTB or soon to be masters in regular SIFF" - Honestly I am not picking on anyone. This is the only way I have to address this stuff since we didn't ask for contact inforamtion on the survey. SIFF Masters compete iin their own catagory against each other. The soon to be masters...there is no way we can separate them out from everyone else. This goes along with something someone else sent in about adding a beginners and intermediate catagory. That would mean prescreening everything. Last season there was around 48 hours of machinima to watch. That would mean that the staff would have to find the time as soon as the films were released to watch everything ASAP. One of our staff members works 12 hour days with very little time off. Another one of our staff is in University full time. Watching all this stuff as soon as it comes out would put a huge stress on our staff that we don't want. Then we would have to sit down and debate between ourselves where each submission belongs. What if we can't agree on something? What if people don't agree with where we put them? What if we asked them where they wanted to be put and we didn't agree with it? This would seriously hold up getting the polls up for everyone to vote on and potentially stop people from re-entering making SIFF die a slow death. Pulling out those that would be put in the masters catagory prior to putting up the polls isn't really fair. This means ruining the SIFF experience for the few people that make masters every season. They aren't officially masters so they can't compete there, so where would they compete? Against each other? That's not going to work because some seasons only one or two people are put in the Masters catagory. It would also mean getting a second group of people with commitments in real life together to watch everying quickly and make the decision about who will make Masters early on where we could do with them whatever we decided would be "fair" (and there isn't much that would be fair to them). Logistically this would also be a nightmare. You also don't annonce "winners" before vote even starts and that is, essentially what we would be doing by separating those that will be added to Masters at the end of the season. The films submitted by the Masters are there to inspire, to push each of us to improve. While a big part of SIFF is to showcase our films and practice our craft, everyone wants to win and/or be acknowledged for what they have done. Everyone wants to be told "You are good enough to be a Master." We need those films that are better than ours to encourage us to improve. I am not a master, as much as this surprised Gus Rockman on a regular basis, who thinks I should be there based on creativity alone. I don't mind competing against those that are better than me - the almost masters - because no matter how much I improve there is always going to be someone better. There is always gonig to be someone with a better eye for various details than me. There is going always be someone with more skill than me because of their major in university or because they have more time to perfect the craft. This is just the way of things and those people shouldn't be penalized because I don't or can't live up to their standards. It's my job to find the time to improve. I really hope that makes sense. One thing that people may not realize is that the Masters are approachable. They are willing to help people and give feedback on how to better do things. They are more than happy to help. Believe it or not, their first machinimas were probably pretty bad...and speaking bad quality machinima I want to direct everyones attention to Manscaping with Duct Tape. If you haven't watched this you should. Fall 2012's "Best Advert". I threw this together in 15 minutes tops. I'm not kidding. It was written and put together on the fly. No planning, no nothing. I did it to amuse myself and very little effort was put into it. True story, Min chased me down and told me to enter it, and that if I didn't, she would enter it on behalf. Yes, I was blackmailed. From a technical standpoint it is probably one of the worst pieces of machinima ever submitted to SIFF. This is NOT something I would have ever said "This is good enough for SIFF" and I really didn't expect it to get more than maybe 5 votes, and I am being generous there. It did not stop it from winning against things that people spent more time on and were technically oh so much better.To this day I still have no idea why it won and why people like it. I have seen brand new machinima makers put together better quality stuff. A peice of machinima doesn't have to be a technical masterpiece to be entertaining and enjoyed or even winning. Remember that. "Promote it more on social media" - I will admit, we fail here. I hate admitting that because I spent a number of years working in social media. It comes down to time and resources. Promoting stuff on social media is a full time job in itself and we need people dedicated to doing it. We are working on this and I think we are slowly improving. To everyone who thinks we're perfect, thanks for the vote of confidnece. I think we have a lot of room for improvement and every season we make adjustments where they are needed. I want everyone to keep sending us their feedback. As you all know, we have been talking a lot about the future of SIFF and what we need to do to enure it's sucess as it grows. We've gotten a deal of feedback and we will probably continue to throw ideas out over the next several weeks in the form of SurveyMonkey surveys since they are quick and painless for everyone to answer while preserving anonymity. Bare with us, we want to make sure we make the best decisions. I do want to take a few minutes to address a few things that have come up wthrough the survey process thus far. Chat/Instant Messaging: There is no easy way to do this. This is NOT something Webs supports. We have tried to institute this before and we have tried again recently. It's not going to happen. Not on Webs. The site would have to be moved and that means hosting, and hosting isn't free. Profile Pages: Again, this is NOT something that can accomplished with Webs. It's not that we don't want to add features that would encourage use of the site it's that we are limited with what we can do with what we have have Remember, we all do this in our spare time and we make no money off the site. If you take a look around, the site is ad free. Minraed pays for hosting out of her own pocket and has invited everyone to to use the site. This has always been a labour of love but when things don't pay for themselves costs need to be kept under control. We hope that you all understand this. More Catagories: We would love to do this, in fact, we have had different catagories over the seasons. The problem is, they don't get used. Someone suggested an anime catagory. We don't have people actually submitting those kinds of films to justify giving it it's own catagory. This goes for a lot of other things. There is a complaint that things are all English based. This goes along with the catagories. Peopel weren't use the Foriegn Film catagory. At most we got two or three entries a season. Some seasons none at all. We have pushed this catagory in the past and people just choose not to use it. If we get the entires to support it we will, by all means, bring it back. Support for other languages: We have tried really hard to do this in the past. It's something people want, but it's not something we have had a lot of help with when asked. We need people who will help us keep rules updated in other languages. It's an ongoing theme. SIFF has a staff currently of three people. Three people make everything happen. We make sure emails and questions are anwered, that the playbill gets updated, that our YouTube channel is maintained and playlists are updated, that voting happens, that there are articles for the magazines, and so much more. We can't do everything. People want SIFF to happen and for things to run smoothly but they don't want to help. Not to sound mean, uncaring, or rude, but we are three people and we can only provide those things that we can do ourselves. A Third SIFF Cycle During the Year: Wow. I don't even know where to start with that one. Let me repeate something I have said already. We have a staff of three people. Three people with families, work and school. To add a third season would be very stressful to us. As it is, we get a two month break between the fall and spring seasons before we have to start doing all the things that happen behind the scenes to make SIFF happen. We are talking about moving Battle of the Bands bewteen SIFF Seasons at the moment for a number of reasons, and that will fill those few months of down time. We really don't want the quality of anything to suffer and we don't want to run ourselves ragged and suffer from burnout where we end up canceling seasons because we can't keep up. Do More with Vocie Acting: We are working on this. The last two seasons we started working more with voice actors and we are still working out the best way to do this. We will be adding a voice actor to our staff to help us with this. We are oppen to suggestions. Sectons for Stories, etc: You can always add these things to the forum. I know it's not ideal, but we have always tried to encourage people to share what they do there. You are allowed to start your own threads to showcase your work. Limiting: I know this suggestion was made with the best of intentions as a way to keep things under control, but we will never limit the number of peopel that can join in one season. We want to give everyone a chance and no matter how many entries we get each season, not everyone gets their films done. Last season we had close to 80 entries and only 53 of those films were released at SIFF. Many of those people we found out when films opened that their products were not done. We also won't limit the amount of time for projects. It counter produtive to creativty on a number of levels. The Sims International Film Festival is now in it's 12th season. For those of you keeping track at home, that's 6 years. 6 years. That's a lot of machinima. I know we have said this a million times, but SIFF has grown so much larger than we expected it to over the seasons. Recently when the Machinima Masters Page was put up and we were going through all the past magazines hunting down this information, it was amazing to see that progression from having just a handful of films to over 70 entries a season. SIFF has grown into this huge thing that has become a lot of work for a small staff to manage. We made no secret of the fact that this season Minraed stepped back because her personal life has become very busy and demading. Now it's time for us to step back and re-evaluate where we are going with SIFF. We realize that there is no other Sims fan site dedicated to machinima and nothing comes close to what we do. That is why, as we make these decisions, we want to hear from you. We want your feedback on SIFF. What you like. What you don't like. Please take a moment and visit our SurveyMonkey opinion survey and give us your feedback. It won't take long and all responses are anonymous. I would like to take a moment to stress a very important philosophy that we stand by here at Simatography, and this is one of suppport, encouragement and most of all being a safe place to share your creativity. Yesterday, one machinima maker who often presents his work to us to view and comment on (presumably hoping for positive comments and support), left a comment on one of our member's SIFF trailer calling it "stupid". This is NOT acceptable behavior. For one, being rude and putting down someone's hard work when they are brave enough to create and share is outright MEAN. Why does anyone feel that it is ok to be mean to someone who did nothing to deserve it other than to make a machinima that isn't to your taste? Simatography does not support people who treat others this way. Second, I would never attempt to change everyone out there who has ever made a negative comment on one of our SIFF participant's machinima, there sadly will always be those people out there. I am not here to police the world, nor to protect all of the SIFF community like an old mother hen. The point of this is that this person is someone who expects our support as a member of this community, and yet turns around and says such hurtful things to someone else. And a final point is that this opinion notice does not include positive feedback. Sometimes when a comment gives good feedback about something that isn't done quite right, or something that could be improved upon or whatever, this can feel hurtful a bit too, but that type of comment is meant to help a person learn and improve. This is totally acceptable. So in conclusion, let me be clear that I am committed to upholding the standards by which we have built this community over the past 6 years, and that is that we are one of respect, support, encouragement and safety. If any member or SIFF participant feels that it is acceptable to make hurtful comments on someone else's machinima or other project then that person is not welcome here and will no longer receive support from us. Please be kind, good karma will come back to you. Another season of SIFF has gotten underway and we have many exciting things in store for you. Each season brings old standard expectations, and always new ideas and changes to make it better than ever. We are looking forward to another awesome season and the opportunity to showcase some of the community's greatest talents. Even though it is a film festival, we always like to emphasize that you don't have to be a machinima maker to join and celebrate with us because we really do have something for everyone. This season kicks off early as we hope to give more people time to learn about us and prepare. We have battle of the bands already underway, as well as some of our startup challenges like the official SIFF poster challenge. Be sure to head into our SIFF forums HERE to get all of the details and updates. If you have any questions about SIFF we have special forum thread open for you so don't be shy. We are always here to help. Keeping up with blogs and updates here is clearly not my strong point. I apologize if this is where you turn for important news. I would like to say that I promise to do better in the future, but it is hard to say since I have such a demanding life outside of here that I find it impossible to do everything I would really like doing. So... please be sure to follow us on facebook, twitter and tumblr and subscribe to us on issuu and you won't miss a thing. So yes, SIFF films are open and it is time to vote! Polls are open until April 11th so watch them all, take your time and vote fairly in support of the many talented machinima makers. And a final note of interest is that our next Simatography magazine is about to be released. It will be smaller since we have SIFF right now, but you will find some really great community spotlights inside. Watch for it on Issuu later today.